Perched on a hill-top high in the mountains of the southern Auvernge region of France, miles from anywhere, the unique restaurant and hotel created by famous Chef Michel Bras, and now with his talented son Sébastien Bras since 2009, is regularly full to overflowing. One would swear that this extraordinary chef had studied in Japan from his style of presentation on the plate and his spare artistry in designing his dishes. .
Those who believe in re-incarnation claim he must have lived previous lives in Japan. Instead, he claims his influence is entirely from his mother's cooking but his restaurant was visited by so many from Japan he eventually went there and established Restaurant Michel Bras in that country. His abiding love of the wild flora that braves this harsh environment of the mountainous plateau and his passion for the region and town of his birth, Aubrac and Laguiole respectively. Yet, meals here bear little similarity to those hearty affairs his mother served her family. 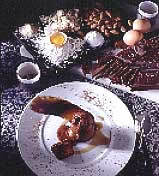 Today, around the huge polished slab of gray granite that serves as a table in the center of the kitchen of Michel Bras' ultra modern establishment, is the evidence of his unique vision for cuisine which seems to have soaked into the genes of his son. Michel Bras is filled with what might be considered contradictions in another, but which turn out to be complementary talents in this very special chef. He is both coolly intellectual and yet passionate about his food. He has an abiding love for the traditions of his region, a remote, gray and green, granite snagged land, filled with gray stone houses roofed with gray slate hunched in a high-land environment where the grass is green but the trees leaf late and nature punishes. A land that boasts of its own breed of beef cattle, its own cheese and its own unique sausage not to mention its knives used all over France known for an unusually shaped blade and handle. Snow covers the ground until late spring. 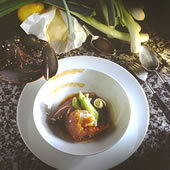 Even as he celebrates all these traditional influences in his food, he has built a hotel/restaurant of such a modern style and impaled it like a shard of crystal into a prominent hillside presiding over his home town of Laguiole that it is at once exciting in its daring and yet astonishing in its clashing lack of conformity to its surroundings. Father and son use whiteplates as an artist uses a blank, white canvas. 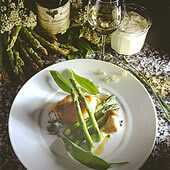 The dish becomes a painting in food, not just to the eye but most assuredly to the palate. A paint brush will be used to swipe a sauce across the surface, a spoon to dribble another. Crushed seeds, dried and crushed orange peel, young petals from edible flowers, baby shoots of garlic and of wild herbs fresh from the hillsides will be scattered across the plate, just-so, in flavorful decoration. Never just for decoration. For the same reasons that Michel Bras utilizes a pure white plate to carry the artistry of his cuisine, he has chosen the ultra modernist approach for the architecture of his establishment. He wants a cool, calm, unemotional environment that does not distract the visitor from the sensory experience of his food. Just as he considers his food to be an extension of the land around him, he wants the hotel and restaurant structure to spring forth physically from the land itself as a symbol representing his culinary philosophy. 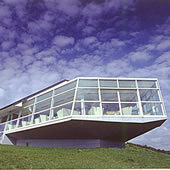 Thus the main building housing the lounge, reception, dining room and kitchens is designed to appear to be surging out of the loins of the hillside, half in half out. Connected to and of the land but simultaneously thrusting into unexplored space, unseen and unlimited frontiers ahead. "We always have something to learn from the riches Nature spreads before us: forever sniffing, tasting, observing. Alpine Fennel and the almondy flavor of Meadow Sweet, prized for its medicinal properties; Elder Flowers fragrant with the heady scent of nutmeg. Vegetables too: Basella with its sticky leaves; the delicate flavor of Chickweed; and 'Tanous' or cabbage shoots. Anything crisp, crackly, crunchy, sharp or sweet-smelling winds up decorating the plates. To all those who make the friendly gesture of sharing our love for Aubrac, we give the best that we and the region can offer. The intensity of these moments will linger on, the gift of a place which makes you forget all else but which will stay bright in your mind forever." The hotel welcomes you from Saturday 4th April until Sunday 15th November 2015.